1. Where can I find Meindl boots? Under Retailers you can find our directory of retailers, along with their addresses, where you can purchase Meindl boots. If your required style or your size is not in stock, your retailer can order the style from us at any time. 2. How can I find the right boots? With specialist guidance. Above all, before purchasing it is important to accurately consider the use and the terrain for which you need the boots. The codes A-D identify the areas of use for each individual style. More details can be found here. 3. Which boot size is the correct one? Information on selecting the right boot size can be found at Sizes. 4. Don't you actually sweat more in boots lined with GORE-TEX®? No. A foot always sweats, no matter whether it’s in a boot with or without GORE-TEX®. What is really important: GORE-TEX® comfort is shown to best advantage if you use special socks suitable for use with GORE-TEX® (never cotton socks). 5. Which crampons fit my Meindl boots? There is no standard for crampon seating, because it is important to always fit the crampon to the boot. Your Meindl specialist retailer can help you in selecting the right crampons for your Meindl boots. 6. How can I best look after my boots? Information on the correct care of your Meindl boots can be found here. 7. I have technical questions about my Meindl boots. What is the best way to proceed? Bring the boots and your receipt to your Meindl retailer. He/she will be happy to check your boots and will decide what to do or whether your boots should be sent to us. 8. The soles of my Meindl boots are slippery. What should I do? If the soles of newly purchased boots are slippery, this may be due to silicone residue from the impregnating agent. 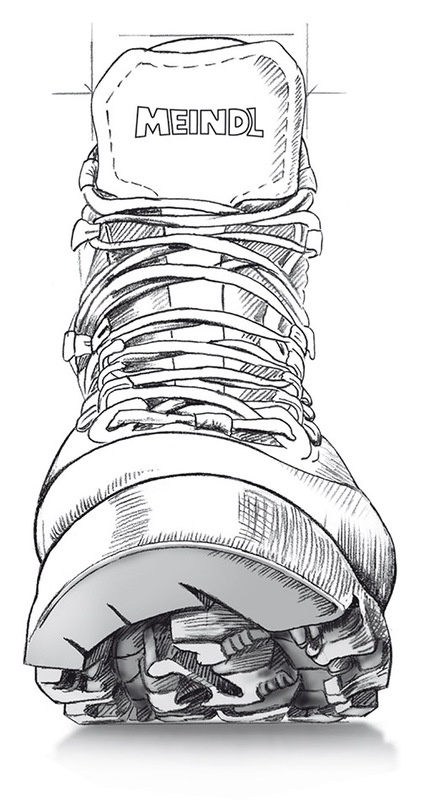 If the boots have not been worn for some time, the surface of the rubber profiled sole can harden and this makes it more slippery – a typical property of vulcanised rubber. Rough up the sole slightly (e.g. by using sandpaper), or walk to “scour” the soles on loose chippings or asphalt. 9. The soles of my Meindl boots are heavily worn. Can they be repaired or do I have to buy new boots? As long as the overall state of the boots is still good, the soles can be replaced without any problem. Your local shoemaker can do this, or you can send the boots to us via a Meindl retailer. 10. The hooks or eyelets on my Meindl boots are rusting. What should I do? You can prevent this by waxing the hooks regularly when maintaining the boots. 11. The hooks or eyes of my Meindl boots have torn out. Can these be replaced with new ones? Essentially, hooks and eyelets can be replaced with new ones. Your local shoemaker can do this, or you can send the boots to us via a Meindl retailer. 12. The seams of my Meindl boots have frayed. Can these be repaired? Generally speaking, yes. This is even the case for GORE-TEX® styles, because we make the seam so that the waterproofing of the shoe is not impaired. The lining will not be stitched through in doing this.